Few grasp how fundamentally the dynamic richness of computer-mediated relationships is changing the very nature of business. We see that we are shifting from a world of products sold in one-shot transactions to a world of "Anything as a Service" delivered in recurring revenue relationships. We see that subscription businesses are emerging in all kinds of industries and growing at much faster rates than their more conventional competitors. It is less apparent is how deeply this changes the nature of businesses relationships, and how all aspects of a company are transformed by the shift from a linear product pipeline to the cycle of a recurring relationship. What we have seen is just the beginning. First a look at how far we have come, then a look toward the next level. A thought-provoking view of how deep this change already is, is in the new book, Subscribed: Why the Subscription Model Will Be Your Company's Future and What to Do About It. I read a pre-release copy and see it as a must-read for anyone with responsibility for designing, managing, or even just executing on business models of any kind -- even if you think subscriptions are not relevant to your business. 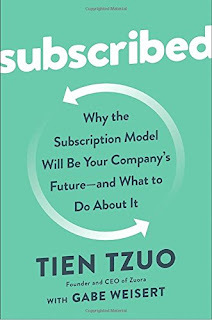 Author Tien Tzuo (with Gabe Weisert) speaks in terms of "subscriptions," but this book is is very relevant to recurring business relationships more broadly. Relationships are the future of business. 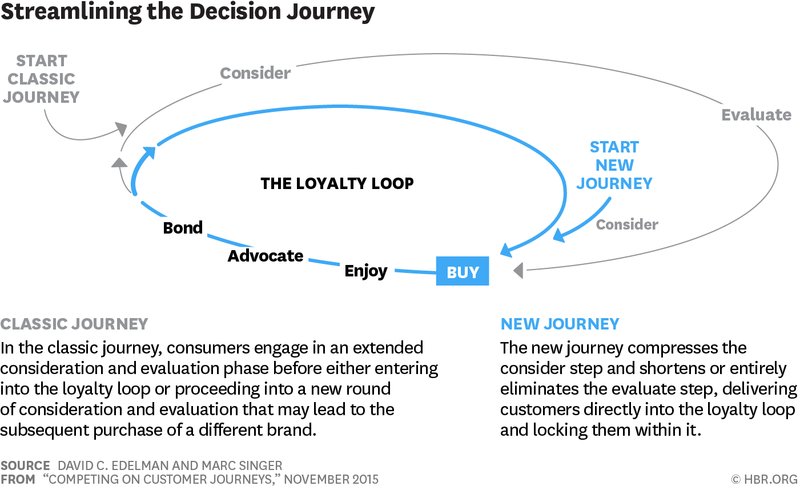 Call it a subscription, a membership, or just a loyalty loop in the customer journey. In our connected digital world, relationships will deepen -- or they will die. Tien applies the experience of his journey from the very early days of Salesforce to founding Zuora and its fast growth to a recent $1.4B IPO -- where he has had a unique view into the guts of thousands of subscription businesses and their growing pains. Zuora has popularized the term "The Subscription Economy" and provided thought leadership in this space, including well-attended conferences and a rich body of Web resources. (I have spoken several times at Zuora events, beginning in 2011.) Zuora also provides rich data on "The Subscription Economy Index," drawn from the anonymized system activity of hundreds of subscription companies around the world (summarized in the book). His book provides a compelling call to arms and compendium of key concepts and best practices. This book also provides an excellent foundation for looking further ahead, to a next level in recurring business relationships. My work on FairPay suggests that next step is a sharper, deeper, and more cooperative focus on the value of experiences. I see that shift of focus, leading to a deepening of relationships in which customers are more equal partners. Subscriptions are the most explicit form of recurring relationship, but the essence of what we must now seek to master is how to value experiences, in what I would describe as The Relationship Economy (or The Relationship Value Economy). We all know that the essence of business is value exchange, but how deeply and broadly do we think about value? How often do we ask our customers about value as they see it? I build on what Tien covers, adding exploration of the largely neglected layers of value, and how closer attention to value can enhance relationships. My focus here is primarily, but not entirely, about B2C relationships. Those are generally asymmetrical, with a human on one side, and an organization on the other side. Our current mind-set is that businesses set the rules of the game, and consumers play their role within those rules. But I suggest that is a temporary anomaly that will revert to a more balanced model. Tien describes the thought experiments his team did in the early days of Zuora, thinking about what the limits of subscriptions might be -- could you apply it to refrigerators? floors? elevators? roofs? "Here's the secret we used to answer all of them in the affirmative -- tease out the service-level agreement that sits behind the product. It works for everything. So instead of a refrigerator, it's the guarantee of fresh, cold food..."
Whether you think of it as a subscription, or a membership, or just a service agreement, the essence is this recurring cycle of interactions -- the result is that the flow of business changes from linear to circular. This has deep implications, both as to operations, and as to the nature of the relationship. Game theory tells us that one-shot games create very different player behaviors from repeated games. All recurring business has elements of a repeated game, but effective game design can make the game more productive, cooperatively win-win, and long-lived. Let's start with the operational aspects, then consider the broader game. 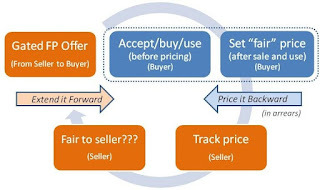 Tien explains how recurrence changes business operations to center on the customer interaction cycle, as shown in his diagram (here). He explores how this changes all functions, from innovation, marketing, sales, finance, and IT. For example he explains how a fundamental change in finance is needed, from the backward view of one-shot product sales inherent in Generally Accepted Accounting Principles (GAAP), to a new kind of accounting that is forward looking toward Customer Lifetime Value. A meaningful accounting must recognize that what matters is not the revenue in the last quarter, but the recurring revenue stream for many quarters forward (decreased by churn, and increased by customer acquisition and up-selling/cross-selling). He explains how he convinced his investors that growth expenses are much like capital expenses, in that they pay off not in the next quarter, but over an extended time -- and that Wall Street has been slow to recognize this. Similarly, he explores how this cyclical pattern affects all other functions, and requires greater cross-functional cooperation to assure a good customer experience at each touch-point. This deep enterprise strategy focus draws on Tien's role at Zuora, competing with the likes of Oracle and SAP. That focus makes his book a strong complement to the excellent existing books in this space that are more marketing-focused, including Anne Janzer's Subscription Marketing and Robbie Kellman Baxter's The Membership Economy. Pricing and packaging as "one of the most powerful growth levers"
"Pricing and packaging" is an old-fashioned-sounding term that might remind you of stocking grocery store shelves, but for subscription business it is one of the most powerful growth levers you can have...In fact pricing is the most important of the four P's [Product, Price, Promotion, Place, from Marketing 101]. ... Subscription pricing is trickier...at the end of the day, you're not pricing an object, you're pricing an outcome...what do you do about the fact that customers may assign different value to the same outcome? This ambiguity is intrinsic to the subscription model, and it can be either empowering or paralyzing. ...But what happens when you get it right? Whoo boy. Well, customer acquisition gets much easier, and churn gets reduced. Better yet, as your relationship with each subscriber deepens, as you become a bigger part of their lives, that value is translated into revenue...creating a virtuous cycle...You can create intuitive customer journeys...with relevant tipping points along the way. 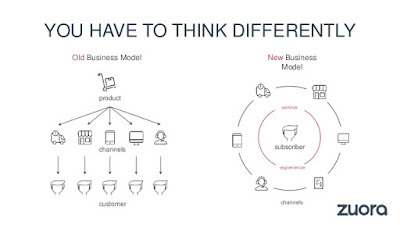 And when your pricing model locks into that subscriber journey, this is when (click) your business model locks into subscriber relationships, and a valuable company is born. That nicely sets the stage for the next level, which we will get to shortly (but first a broader view). 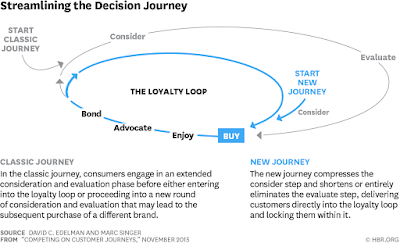 In the classic journey, consumers engage in an extended consideration and evaluation phase before either entering into the loyalty loop or proceeding into a new round of consideration and evaluation that may lead to the subsequent purchase of a different brand. The new journey compresses the consider step and shortens or entirely eliminates the evaluate step, delivering customers directly into the loyalty loop and locking them within it. 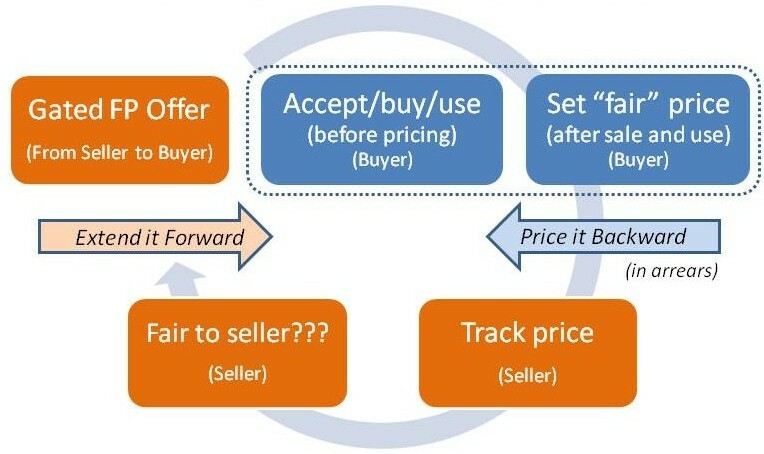 Thus, recurring relationships are based on "locking" customers into this loyalty loop. The question is whether you try to lock them in by using zero-sum manipulative strategies, or by gaining their trust and cooperation with win-win strategies that deliver value to the customer. As Tien points out, early subscription businesses such as book or record of the month clubs "shipped products by default and made customers pay the price...when they fail to cancel in time... Sadly, lots of companies still depend on customer neglect in order to sustain their zombie business models." Manipulation can work in the short-run ("you can fool all of the people some of the time..."), but which path leads to winning in the long term? Smart marketers increasingly recognize the importance of customer journeys and loyalty loops. Tien and the others teaching us about these subscription and membership models clearly argue for customer experiences that build trust and loyalty. Tien and many others see value-based pricing as a key factor in doing that. To that end, I suggest we focus on the unseen connecting layer in Tien's diagram. It shows the inner circle of the customer's view (subscribe, renew, ...) and the outer circle of the business operation's view (quote, order, provision, ...). But what connects these layers? Operationally, it is dialog between the customer and the business. This is increasingly a digital connection that can become much more fully bi-directional and nuanced. We are just beginning to tap the power of these connections, using CRM systems (now mostly just for problem handling) and social media (still erratic and largely decoupled from operations), and nascent uses of chatbots (voice and text, powered by AI) that will give this more depth, breadth, and nuance -- and more bi-directionality. But what is the substance of these interactions? Value exchange and value propositions that underlie the interactions. Customer consider, evaluate, buy, enjoy, advocate, and bond because they are seeking value. Everything else is just a a means to that end. There is specific monetary quid pro quo (typically in the form of price per unit of service), but that is judged in terms of a rich world of factors such as usage, outcomes, service, and support -- and fuzzier values such as responsiveness, risk, social values, transparency, and trust. We need this layer of dialog about value -- in all its relevant aspects -- to build a strong loyalty loop. Much like flows through the semipermeable membrane of a cell, this dialog about value is what connects the customer to the business. If the membrane is smartly permeable in both directions, and well-centered on value, the loyalty loop grows strong, and stays strong -- a symbiosis. How do businesses deal now with dialogs about value? Doesn't it seem that most business want to talk at the customer about value, but rarely want to hear from the customer about value? Even when there is good dialog about the trappings of value, how often does it get to the core issue? Rich dialog about value is typically limited to occasional offline focus groups that bear little relation to reality, supplemented by haphazard social media interactions. In commercial relationships, we have a broad landscape of value, but it all comes back to the exchange -- what do I get and what do I give. Price is the monetary part of the exchange that balances all the other aspects of value. But how do we talk about price? Businesses set price unilaterally (especially in B2C). They say what they must about price to get initial sales, then seem to avoid the topic like the plague, bringing it up only when they want to initiate a change. Prices are mostly take it or leave it -- even though subscription businesses concerned about churn sometimes negotiate discounts on an exception basis to retain a customer who seeks to cancel. The squeaky wheel may get a bit of grease, but customizing value propositions is the reluctant exception, not the rule. Pricing can be cost-based, competition-based, or value-based. 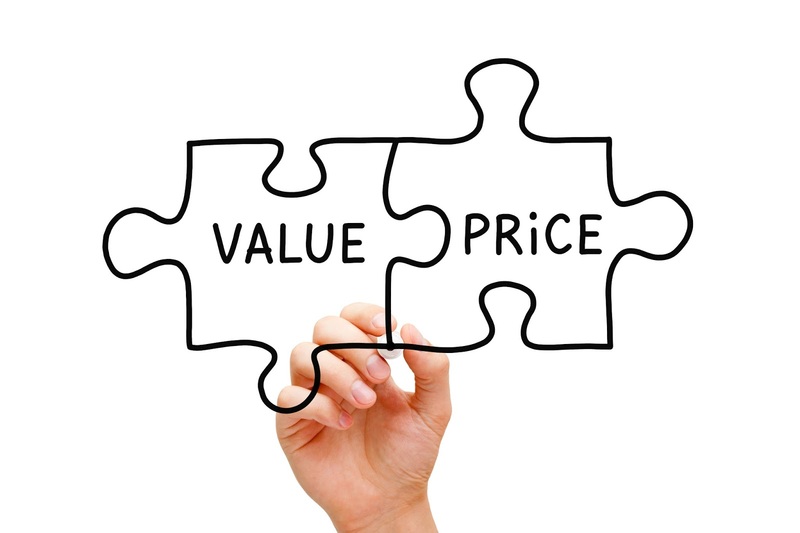 In the B2B world, it is widely recognized that value-based pricing is most effective. The problem is that such pricing can get very complex, considering many dimensions of usage, performance, and outcomes. For large accounts there may be meaningful customer participation in pricing, with ongoing price negotiation and adjustment processes. In the B2C world, value-based solutions are generally sacrificed in the interests of simplicity and scalability. But, as Tien observes in the passage above, pricing and packaging is too important to just take the easy way out. Now we can conduct dialogs about value that work for consumers, if we get smarter about how to do that. Many say consumers require simplicity, but they also want fairness. Dialogs about value are a traditional behavior, engaged in throughout human history. It is only in the past century and a half that we opted for the scale efficiencies of uniform, pre-set, seller-mandated pricing and sacrificed these customized dialogs about value. Having grown up with this mind-set, we forget that things were ever different. You can create intuitive customer journeys...with relevant tipping points along the way. And when your pricing model lock into that subscriber journey, this is when (click) your business model locks into subscriber relationships, and a valuable company is born. How do we get that lock in? A key aspect of pricing is whether it is usage based. Tien's view across both B2B and B2C businesses reveals some key points about the metrics of value. He notes that "at its heart, usage-based billing is a way of quantifying value...how they actually use your service...a 'value metric.' Simply put, a value metric should do three things: align to customer needs, grow with customers, and be predictable (both for customers and the organization)." But his firm's analysis of the subscription businesses they track finds that "only about 27 percent...use some sort of usage-based pricing today." He finds that those who do grow significantly faster. In B2C, unlimited usage plans are generally the norm. But, referring to cable companies, Tien says "smarter usage-based billing...will make their video content services more responsive and valuable." Conventional wisdom is that consumers don't like usage-based models, but I suggest that is just because we have not yet gotten creative about applying modern technology to let us do usage-based pricing in a smarter way. We need to find pricing strategies that are truly aligned with the value that each customer perceives. 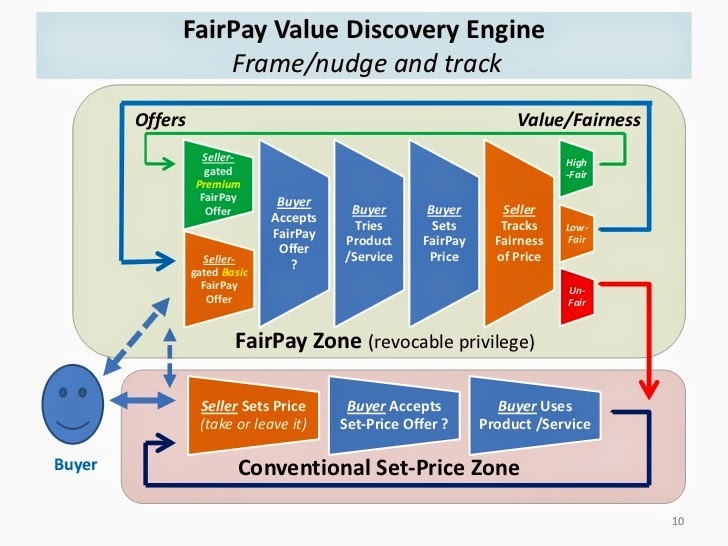 FairPay is an open architecture that seek to align price with value in its broadest sense -- at all relevant stages in the customer journey -- and on an individualized, dynamic, context-specific basis. (See this article in the Journal of Revenue and Pricing Management, or this illustrated summary from ESADE Business School.) FairPay transcends profit and non-profit orientations, and applies controls that can be as tight or loose as desired by each business. 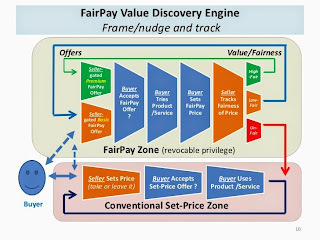 FairPay centers the customer journey on dialogs about value, and drives that by empowering the customer -- while enabling the business to maintain control based on tracking the customer's reputation for fairness. These levers are applied in a cyclic game that encourages cooperation to continue a mutually rewarding relationship. Pre-set packaging -- are packages (bundles) locked-in in ahead of time, or as items are desired? Does the customer need to know in advance what content they will want, or how much of it? Pre-set usage levels -- does pricing ignore usage, or relate to pre-set usage tiers, or does it depend on other aspects of value and outcomes? What of customers with widely varying usage levels? Does all-you-can-eat pricing make any sense for the majority of users who are not "average?" If pricing is usage-based, are there reasonable discounts for volume (and perhaps price caps or rollovers to minimize customer risk)? Pre-set price schedules -- does the business have unilateral control of price schedules, or does the customer participate in determining price based on their perceptions of the value experience? How is ability to pay factored in, if at all? Advanced forms of FairPay address all three of these aspects. Think of this as finding prices and packages that map to value with customized fidelity, considering timing and risk. The breadth of this architecture is in how control is applied by the business. With the most strict control, we have the conventional, take-it-or-leave-it model of seller-set pricing. With the most loose control, we have voluntary patronship models (like those offered by Patreon, Indiegogo, and Kickstarter), voluntary membership models (like The Guardian), and pay what you want (perhaps most successfully applied by Humble Bundle), where customers have full control of pricing. But however strict or loose the control, the focus is on the cyclic nature of the relationship. Too tight, and too many customers are unhappy and leave the relationship. Too loose, and free-riders may make the business unsustainable (ending the cycles). 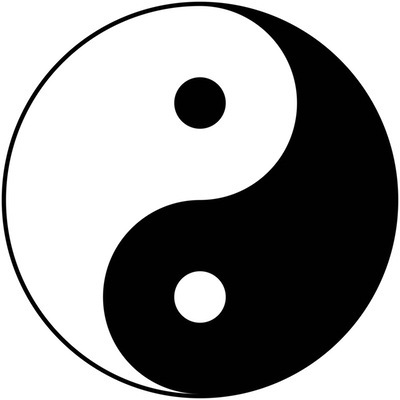 The right balance depends on the nature of the business, the customers, and the service and how its value is perceived. This membrane of value is what brings these factors together, and empowerment, dialog, and reputation are the tools a business can manage to find the right balance -- as that balance changes from customer to customer, and from cycle to cycle. Throughout the customer journey, effective dialogs about value are essential to keeping this pro-actively on track, building cooperation and trust, for a wide range of customers, over time-varying contexts. From this perspective we also see that Customer Lifetime Value (CLV) is just one of two critical success metrics -- it reflects one side of the total picture. Businesses fail to recognize the equal importance of the complementary metric, Vendor Lifetime Value (VLV) -- the value the business provides to the customer over the lifetime of the relationship. Recurring businesses flourish when the customer looks to the business not for the best bargain right now, but as a reliable and trustworthy source of continuing VLV, The way to sustainable profit is to change the conversation from price to value, and from short-term to long-term. 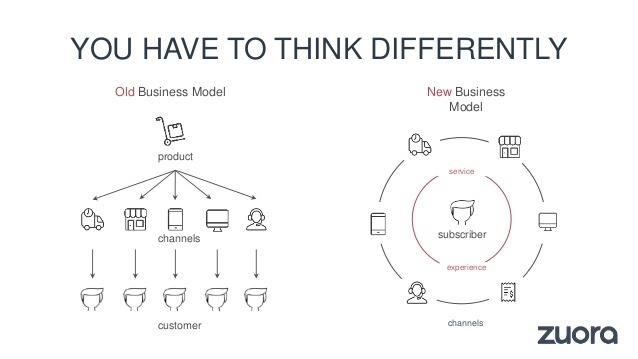 Tien makes a big point of how customer-centricity and customer experience become critical in subscription businesses. FairPay takes this to a new level. Tien points out how "...IoT [the Internet of Things] allows you to rediscover your customers. It lets you learn what they really want. In fact, I would argue that the only true competitive advantage is your relationship with and knowledge of your customers." I have written about how IoT provides a new kind of data about value (an IoT Cloud of Value), and how FairPay's dialogs on value complement that with direct input from customers (and how that IoT data can help validate what customers say about value). Much as I have done, Tien alludes to traditional modes of commerce: "Once upon a time, we used to know the people we bought from...we used to know the people we sold to, the neighbors in our village. All that knowledge got lost a long time ago...But it's coming back in a big way." Price is the visible metric of net value, and competitive success is really a matter of value propositions and how a business orchestrates them. Tien speaks of a new "golden age of marketing" and how "the marketing department becomes a giant test laboratory." He speaks of how "subscription businesses need to constantly be optimizing revenue through pricing," and how "price triggers match customer requirements and demonstrate value." FairPay shows how to take that from an occasional thing and operationalize it throughout each cycle of the customer journey. Part of that can be seen in this more detailed view of the multi-layer, cyclic, repeated game structure of FairPay. It shows how the game serves as an adaptive value-discovery engine, providing an architecture for adaptively structuring products/services into tiers, and segmenting customers based on what they value, their willingness to pay, and their fairness. By embedding these dialogs about value deeply into the customer journey, businesses can turn their everyday operations at each touchpoint into ongoing and continuous business experiments. This centers on price and value propositions, providing a base on which to become adaptively experimental about not only pricing and packaging, but also about product/service design. With detailed, realtime data about what customers do and do not value (potentially for each unit of product/service), the business becomes an adaptive engine for co-creating value with your customers in ways that can maximize Customer Lifetime Value (and Vendor Lifetime Value) across the fullest accessible market -- and as that market changes. It is all about maintaining a shared understanding about valuing customer experiences in diverse and dynamic contexts. Doing better at that will bring more success for both business and consumers in this digital age of mass-customization. 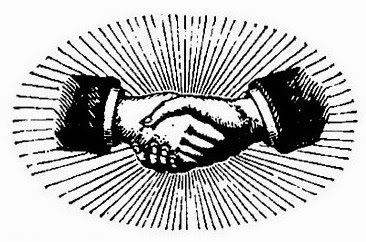 Our Relationship Economy will increasingly shift from the impersonal invisible hand that rations scarce products, to a more human and personal invisible handshake in which both partners in the relationship cooperate on sustainably creating value.